The one-week wait is over! You’re probably still soaking in everything we learned about Trials of Osiris, but buckle up, because we’re going full steam ahead with the Prison of Elders. We got to team up with Mesa Sean and Datto to blindly tackle the level 32 mode of the game type that will be introduced in House of Wolves. This article will outline our overall impressions of the activity and offer a few tips for you and your fireteam on how to succeed. The Prison of Elders is a challenge designed for three Guardians who will work closely together in a coordinated fireteam to conquer whatever objectives are thrown their way. You’re going to squaring off against waves of enemies, while intermittently clearing objectives, all for the Warden’s sadistic pleasure. You can choose to engage at level 28, 32, 34, and eventually 35, for a chance at better loot at the cost of an increasingly difficult experience. We’ll be discussing what Patrick, Mesa Sean, and Datto faced in the level 32 variant. Be aware that the rooms you encounter and the modifiers you face will be different depending on the playlist you choose to take on. With this in mind, treat our following review as simply one variant of what you might have to go through to emerge from the Prison of Elders unscathed. You will be able to match-make with other players on level 28 difficulty, but if you’re able to form your own team, you can take on higher challenges and increase your chances at better rewards. There aren’t checkpoints, so if you leave, you’re going to need to restart at the beginning. However, if you die on a round, you will restart at the beginning of that same round, with the same modifier. There are modifiers, some which can even aid you, and obstacles and objectives you’ll need to face, such as disarming bombs or eliminating a VIP. 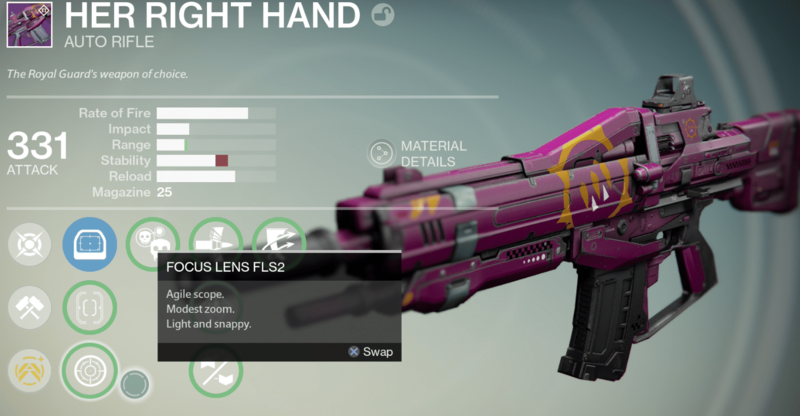 Small Arms – Primary weapon damage is doubled. Exposure – Guardian shields are increased but do not replenish. Catapult – Grenade recharge speed is greatly increased. Trickle – Abilities charge significantly slower. Airborne – Players deal more damage while in the air. All old modifiers are also available, such as Lightswitch or Solar Burn. It begins with your three Guardians spawning in a central location called the Airlock. The camera does a dramatic 360 pan to feature you and your friends’ gear, and it’s a nice immediate bit of flair to get you pumped for what’s to come. An indicator in the upper-left-hand corner of the screen displays “Round 1” and a second one alerts you to what the modifier you’ll be dealing with will be. In the gameplay above, Juggler was the first modifier, which was displayed properly with a tooltip reminding you of what it does. Without further ado, the floating eye retreats through a short tunnel and disappears, and you are given access to your first room. You know what enemy to expect by the theme of the doorway. Walking in, a chaotic and violent looking sight awaits you. A large ship is suspended by wires above the center, and flames engulf areas of the map. Wreckage, rubble, and imposing structures dot the otherwise enclosed landscape, most of which can be scaled for easy vantage points in the battle to follow. As you take a brief moment to explore, you may trigger a floor-trap grenade, which will explode in large AoE bubble. This field of energy slows your movement, and causes damage over time, but will dissipate shortly after its initial burst damage. They can be tripped and quickly avoided through fast movement, or deployed mechanically with a single precision shot from any weapon. Patrick and his team eventually found out the best strategy was to trip these intentionally in order to remove them as deterrents to movement. You’ll quickly notice another indicator in the upper-left-hand corner of the screen, which states “Wave Completed: 0 out of 3” and more-or-less outlines the terms of the first round. You must survive waves of Cabal by dispatching them before they overwhelm you. On level 32, enemies including Fleet Psions, Fleet Centurions, Fleet Legionaries, and Fleet Phalanxes that will rush from all sides. The Centurions sport Solar shields. After taking care of the first wave, you’ll have moment’s respite before you’re rushed again. The second and third waves are similarly predictable, but introduce more and more enemies, including increasing numbers of shielded Centurions. If any of your fireteam happens to die, you can be revived after waiting a period of 30 seconds. This is in line with the Normal Modes of both Vault of Glass and Crota’s End. Once you finish off the last enemy of wave 3, you’ll be notified that the modifier(s) have cleared, and you’ll be instructed to return to the Airlock by the Warden, where you will have a chance to regroup in a safe environment. Take this time to adjust your inventory, requisitioning any weapons from your Vault through the Bungie app that you feel you might want for the next rounds. This downtime to be very important in allowing teams to devise strategies and modify builds and loadouts as needed. After another brief waiting period, the next modifier will be announced, the second Airlock door will open, and you’ll be faced once again with the Warden’s eye. He’ll direct you into your second room for your next challenge. The next room you’ll see in the footage is all Hive. The aesthetic was immediately familiar – lots of dark greens and filthy cavernous nooks, including protruding bones and a dusty atmosphere that created a palpable sense of dread. “Wave 0 out of 3” is the familiar beckon, and the Hive begin to swarm. The first wave is as simple as you might guess. You’ll face some Thralls, Acolytes, and a couple of Wizards. Keep an eye out for the floor-trap grenades again, as they’re as much of an unpleasant surprise in this room as the first. 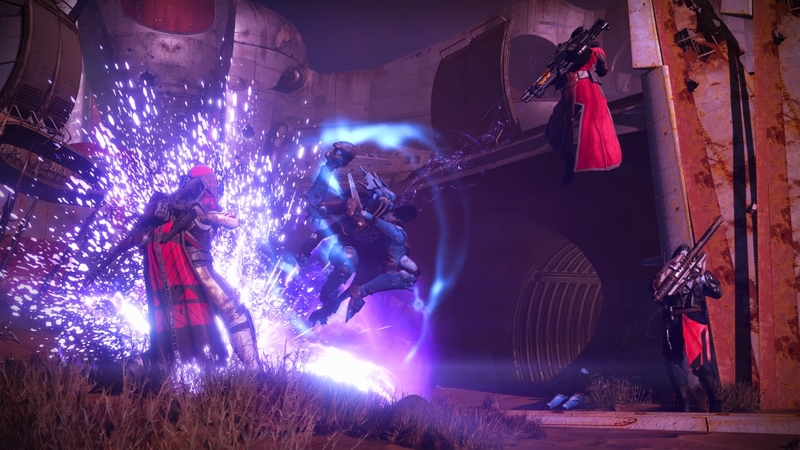 The second wave introduces the Prison of Elders’ first new surprise: a “Critical Objective” wave. In addition to handling the multitude of additional enemies that spawn, you’ll also need to deal with Splinter Mines. These explosives spawn with a 30-second countdown, and before they detonate, you’ll need to detonate them with your own weapons. Their health is displayed somewhat similarly to the reputation diamonds, where a white-filled border shows the amount remaining, while the timer dutifully ticks on. If your fireteam fails to destroy them for any reason, they’ll explode, and the Warden’s displeasure with your performance will result in the de-buff “Warden’s Punishment” that will wipe your team and force you to restart that encounter from the Airlock. Fortunately, you’ll retain your progress up to this point. Once the adds are dead and the three mines are no longer a threat, the Wave will be complete and you’ll be notified in the bottom-left-hand corner that “Variks presents a gift.” Variks the Loyal has the ability to spawn in helpful resources to help aid you. After the Critical Objective he’ll spawn in Heavy Ammo, which will stick around for up to one minute after it initially spawns in. Before the next wave begins, Variks will present yet another gift. This one is particularly special, and finally resolves the speculation of the community. It is indeed the “Rocket Launcher” we’ve seen in teasers and in photographic releases. It’s called the “Scorch Cannon” and it is the de facto relic of the Prison of Elders. It has a preset amount of ammo, and launches highly damaging rockets that also set their targets on fire upon impact. By holding the trigger after sticking a Scorch Cannon round, you can effectively “cook” the projectile, and it will attach to the enemy and detonate for increased damage and blast radius. Use the Scorch Cannon or conserve it, but wave 3 will progress identically to wave 2, simply with more adds to handle. The number of Splinter Mines remains at 3, and they don’t appear to have additional health. It’s safe to say that if you get a good feel for wave 2, wave 3 will be no problem. As you might guess, following the completion of round 2, you will return to the Airlock again for a break before round 3. The format repeats itself: your next modifier is announced, the door opens, the Warden appears, and you make your way into the third battle chamber. It’s worth noting that if you managed to avoid using the Scorch Cannon, you can carry it into the ensuing round. This may prove useful for fireteams that want to conserve its devastation for something coming up, rather than expend it all immediately. Again, as you might have suspected, you’ll fight a different type of enemy in round 3. This will be the Fallen. Their battle arena is also beautifully designed, with an open sky housing docked ships, and sunlight filtering through the purple-tinged air. The battlefield is a battered, rusted red, and makeshift metal edifices provide cover at random locations throughout the map. The first wave consists again of tier 1 Fallen, including red-bar Dregs, Vandals, and several shielded Captains. Under Catapult, the Dregs were relentless with their Arc Grenades, making Patrick and his team wonder if Catapult was any sort of advantage at all. Still, kill them however you see fit, to prepare yourself for another objective wave. This objective wave 2 will again have you dealing with mines. However, the mines have been repurposed to be shielded and immune to your fire. You’ll have to close in and dismantle them manually, up close and personal. Simply stand under them and wait until the meter indicates they have been dismantled. 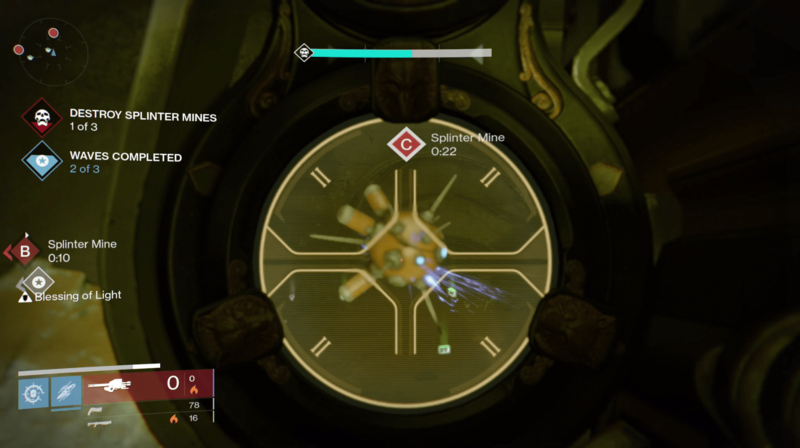 You will have to do this to three mines while dealing with increasing numbers of Fallen, including a slightly-new Shank variant, the Exploder. These will detonate with deadly force when killed or when they get too close, so they’re best handled at a distance. A boss! You’ll deal with a fourth modifier, as well. Patrick’s team got to test out what Guardians have been begging for, “Brawler”, whose description reads “Guardian melee damage is greatly increased.” That’s right, you can count your melee to waste tier 1 enemies with very little personal risk. This even extends to the Gunslinger’s Throwing Knife! Patrick, Mesa Sean, and Datto followed the Warden’s Eye down the tunnel to another Hive environment. They were then treated to a six second cutscene in which a massive Boomer Knight was released from what appeared to be a holding cell. This “Wretched Knight” was revealed to be their target for round 4, and will likely be yours as well. He has a little more health than a typical strike boss, but is thankfully not shielded, and like his smaller Boomer cousins, tends to plant in one location and launch deadly volleys of Arc energy at anyone who pokes their head out. Of course, it wouldn’t be Destiny without a legion of monsters backing him up. Wizards and Ogres come in almost inhumane numbers, in addition to the requisite thralls and acolytes. Your job is to take this guy down as quick as possible, while surviving the overwhelming host of Hive that want to stop you. It’s pretty simple though; there are no new mechanics to worry about. Just burn the boss down while taking out as many adds as you need to. The modifiers will clear as the Wretched Knight falls, and you’ll have to return to (you guessed it) The Airlock one last time, before you face your final round. Round 5 was another Juggler for Patrick and his team, and this was fitting, as they were returned to the Cabal area from Round 1 for their final boss fight. Another six second cutscene showed a Centurion-like foe being released from a containment shield. When the cutscene ended, he was revealed to be none other than Valus Ta’aurc! 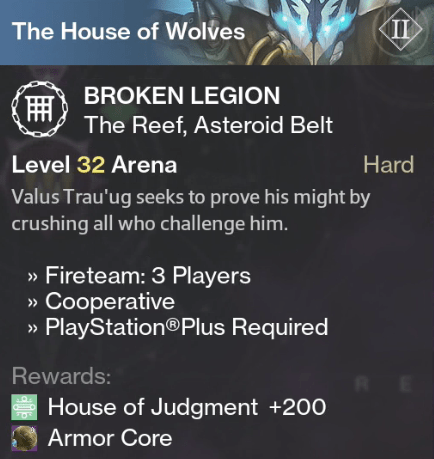 …Oh wait, no, it’s Valus Trau’ug. Trau’ug behaves much like Sha’aul from the Garden’s Spire. He attempts to close the distance to your team with a jetpack and a siege-like Solar cannon. He has Solar shields that you’ll have to strip before being able to damage his enormous health pool. After you land some hefty damage on him – while simultaneously dodging or killing the increasing numbers of Cabal, including T1, Majors, and Ultras – he’ll “recalibrate” his shields. It seems Bungie quite liked the idea that the community was throwing around with shifting shields, and joyfully applied it to easily the most difficult fight of Broken Legion. After you take down the Void shield, and damage him some more, it’ll shift finally to Arc. Repeat again to have it return to Solar. The Cabal are already tougher than the Fallen and the Hive, and the preponderance of Majors and Ultras distracting you from your target make it especially tricky to find times to damage the boss, making this a worthy opponent indeed. If you do manage to get a few hits on him, but your team is otherwise occupied, he’ll recalibrate his shield quickly and you’ll have to adjust on the fly. It pays to be mobile, as Patrick, Mesa Sean, and Datto discovered very quickly. Be patient and constantly vigilant, and you’ll emerge victorious. Well, Bungie still wants to keep a few surprises to themselves, and we can’t blame them. Suffice to say you will be rewarded for your efforts – but you’ll have to wait until House of Wolves comes out to find out more! The environments and atmosphere are fantastic. The map designs are chaotic and match the pace of the fighting to a tee. There are multiple levels in which to gain height advantages, cover to take advantage of, and nothing seems out of place. The Cabal, Hive, and Fallen all have distinctive arenas that suit them perfectly. Early fears of a bland, static, and flat field of battle can be put to rest. Whatever your opinions turn out to be on the rest of the Prison of Elders, we predict you’ll be very satisfied with the care and detail that went into the physical design. 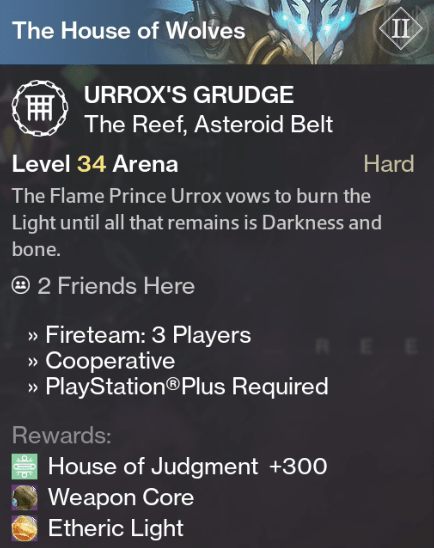 The Prison of Elders seems tough in all the right ways. Enemies spawn from all over, and rush you unapologetically. It scales slowly from wave-to-wave and round-to-round, giving you a chance to get acclimated to what you’re facing. None of the members on Patrick’s team accidentally discovered any means of easily cheesing any of the fights, and the objective waves demanded everyone to enter the fray. Enemy behavior was also refreshing. Crota’s End involved quite a lot of positioning your self just out of range of the Hive, and just picking them off one-by-one. The Hive would arbitrarily advance and retreat and it was simply your job to learn these patterns and take them out. The Bridge, Ir Yût, and the Crystal room were all very static, involving almost zero mobility when actually fighting. 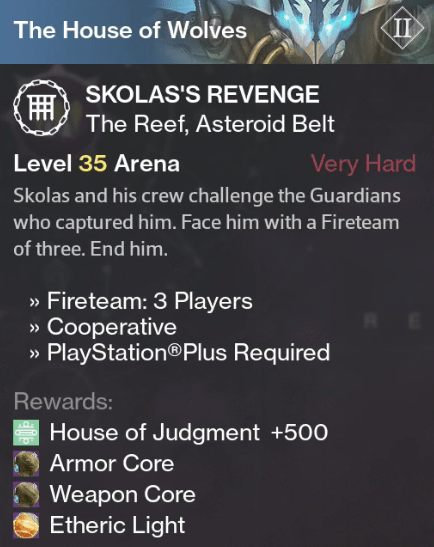 Prison of Elders, at first glance, doesn’t seem to labor under these restrictions nearly as much. Of course, there will always be those looking for a way to trivialize a challenge, and we’ve no doubt we’ll see cheeses pop up. We can only hope that the organic nature of the difficulty will encourage people to take on the PoE the way it was intended. As we mentioned above, the Cabal, Hive, and Fallen you encounter swarm from all over. There’s no immediately predictable pattern to their movements. Wizards, Centurions, Captains, Servitors, and Knights are also thrown into the mix with brutal frequency. As you can see from the footage, staying put earns you a very quick death sentence from your foes. Much like other games’ “Horde modes”, the Prison of Elders realizes the fun in feeling completely overwhelmed, while also pulling its punches enough to let you succeed in spite of it. The key to success will be staying cool in the face of it, and carving your own path through the madness. This is a minor gripe, but the pattern became abundantly clear and even a little bit of an eye-rolling experience. “Get back to the Airlock” and “Wave 0 of 3” were common to every single room. Part of the genius of the Vault of Glass was the idea of moving forward. You would fight a boss, progress further into the depths of the Raid, solve a puzzle, and fight another boss. You got the feeling that there was no turning back, and it was intoxicating. Continuity is very important for an immersive experience. Crota’s End attempted to continue this, but botched it somewhat, having you “spawn in” to certain areas – and this fostered the sensation that your dive into the depths of Crota’s End was fractured and incomplete. With the exception of disabling mines and new modifiers, we didn’t see much of anything that looked really cool in the Broken Legion (Level 32 difficulty). 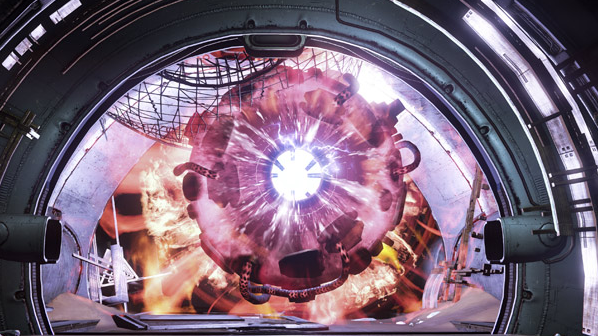 Although the Prison of Elders isn’t a Raid as we understand it, it will invariably draw comparisons to one, as it is supplanting them in Destiny’s newest expansion. To this end, many were likely hoping for new encounters like the Vault of Glass and Crota’s End introduced. The Atheon fight still represents the highlight of Destiny’s creativity, and we didn’t see anything in our Prison of Elders preview that comes close to approaching it. The bosses were, as some have been dreading, re-skins of archetypes that have already been used: a bigger Boomer, a tougher Centurion. The Scorch Cannon, while undeniably awesome, wasn’t required to do anything specific like the Relic or Sword in VoG or Crota, respectively. Fortunately, this lack of variety is clearly being offset by a more fundamentally sound fight design. Gone are the stand-and-wait aspects of Crota’s End, in which waiting for a single person to shoulder all the responsibility would result in frustration from the entire fireteam. The Prison of Elders is an example of Bungie deciding that they’d rather do something simple extremely well than dedicate resources to an ambitious product on which they couldn’t deliver. The realities of Raid design have left us with buggy messes in the past that have drawn the ire of the community, and have only recently been finally patched. If the Prison of Elders has to sacrifice the chance to wow us conceptually in order to comfort us with its stability, that’s a compromise most people will probably be pleased with. 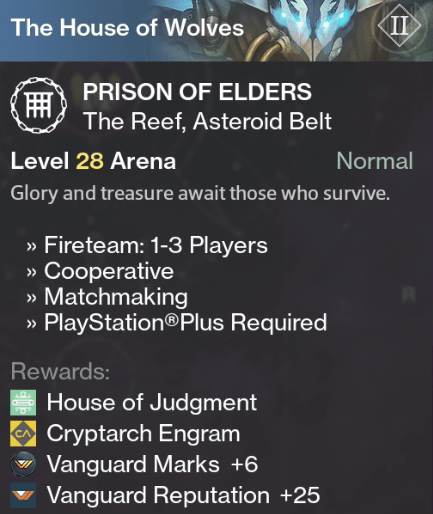 Of course, having only seen level 32, we haven’t seen everything the Prison of Elders has to offer. The harder challenges of 34 and 35 may introduce a whole new set of conditions and mechanics. From what we’ve seen, the Prison of Elders is a polished three-person activity that looks to be both challenging and a lot of fun. The wave-based objectives are a double-edged sword; they bring an element of chaotic enjoyment, but this is somewhat dampened by their predictability. 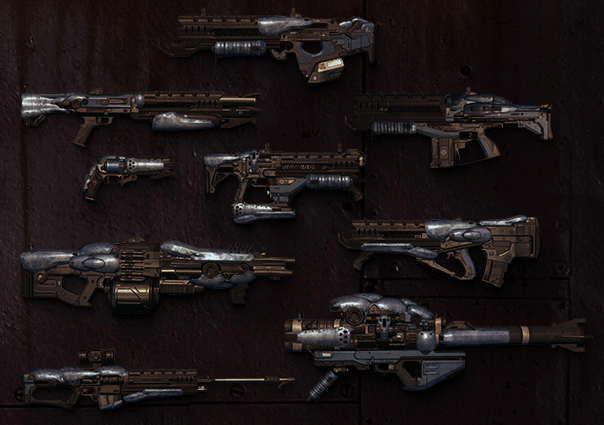 The PoE encourages you to go in guns-blazing, and offers you the familiar Destiny experience on an exhilarating scale. Will it be too familiar? Or will Bungie deliver on their promise to keep the experience fresh, and reward Guardians again and again for returning to face the challenge? Only time will tell. 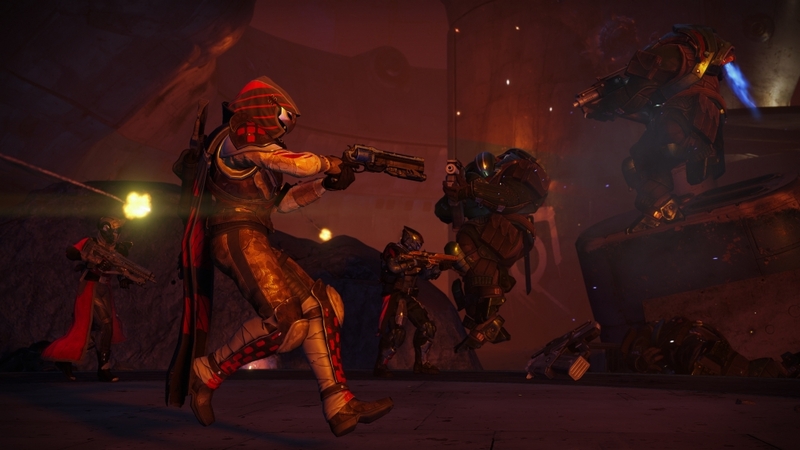 Let us know what you think about the Prison of Elders reveal. Whether you’re excited or disappointed, we’d love to hear it.